Spring is in the air and what better way to have fun, than to hop on down to Hexham for Easter Bunny’s Eggs Factor! 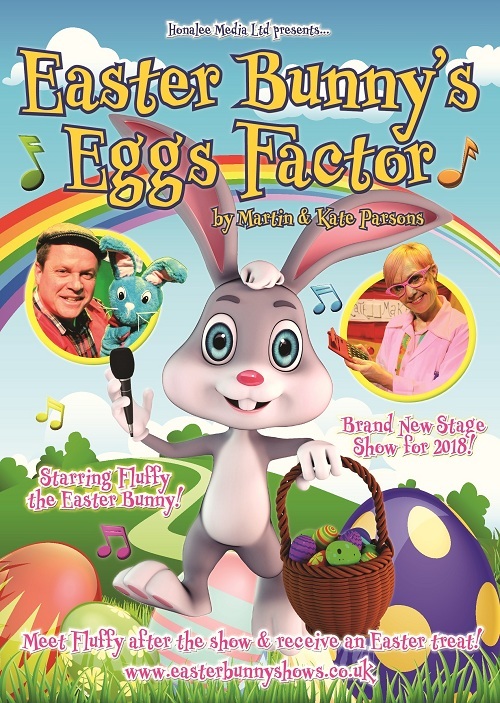 This Easter show is the perfect after school treat, and can be seen at Queen’s Hall Arts Centre on Tuesday 27th March at 4pm. Tickets are just £8.50 and include a gift for each child. - but who will Fluffy think has got The Eggs Factor? can you help them practice and see if YOU have The Eggs Factor too? - and a special chocolate treat from the Easter Bunny himself! - then meet the Easter Bunny afterwards and receive a special Easter treat! Here We Go Round The Mulberry Bush and more! Easter Bunny’s Eggs Factor is a family show particularly suitable for 2-7 year olds and lasts for 40 minutes, followed by our popular meet, greet and treat with the Easter Bunny himself – including a free Easter treat for every child! So hop on down to Hexham!